3/21/62, and the Yankees’ Robin Roberts deals to the Phillies’ Johnny Callison in a spring training tilt at Clearwater, FL. Wait, what? 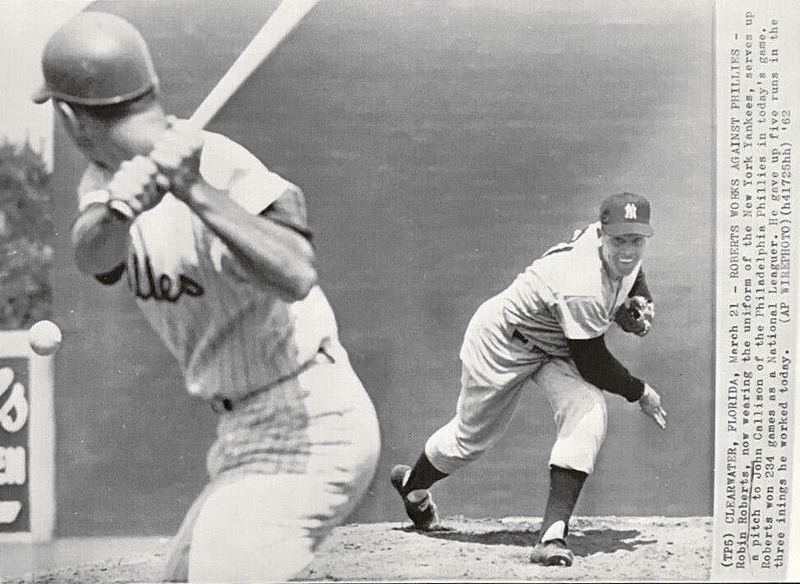 Yes, Phils sold Roberts to the Yanks for ’62, and he went north with the club, but never got in a game (largely due to the emergence of young hurlers such as Jim Bouton); upon the Yankees releasing him, he did stay in the American League, signing with the Orioles in May. This was also a special day for Roberts, as Robin’s #36 was retired (as it was the Yankees first trip to play the Phillies that spring), which happened to be the Phillies’ first retired number ever. Roberts gave up 4 runs, but earned the win. Right, Tom, Roberts went north with the Yanks in ’62, but really after ’61 it looked like he was through. However, he regained good form for the better part of four more years with the Orioles, before hanging them up in ’66 with the Cubs. One of the great work horses of all time and, during his peak years, just a tremendous, courageous pitcher. Over 20 wins six straight years (led league four in a row), six consecutive over 300 innings pitched (led league five straight), led league five in a row in complete games, twice in strikeouts. Robin, like Tom Seaver, was extremely durable and cerebral as well. Both possessed the “drop and drive” follow-through in their pitching mechanics. Great points by Bill, who was an avid NY Giant fan in Robin’s heyday. Roberts was also very active in improving the players pension plan, being extremely active as a union advocate, consistently fighting for the monetary rights of his peers. Just ask Joe Torre.